The chief ministers of Mizoram and Meghalaya, Zoramthanga of the Mizo National Front and Conrad K.Sangma of the National People’s Party, were part of the 11-party meeting held in Guwahati on Tuesday to announce that they would jointly go ahead to oppose the controversial Citizenship Amendment Bill. The Nitish-Kumar led Janata Dal (United) was also part of the meeting. “We have come together for this convention and passed a strong resolution condemning and to oppose the Citizenship Amendment Bill intended to be passed. If the bill is implemented, it’s very dangerous and harmful for us. We will have to take strong steps against the bill. We will meet the President and the prime minister. We will also invite likeminded political parties so it can be opposed together,” said CM Zoramthanga, who is also president of the Mizo National Front. Besides the MNF, NPP and the JD(U), the United Democratic Party, the Asom Gana Parishad, the Naga People’s Front, the Nationalist Democratic Progressive Party, the People’s Democratic Front, the Hill State People's Democratic Party and the Indigenous Peoples Front of Tripura were also part of the Guwahati meeting. Six regional parties from the northeast are part of the North-East Democratic Alliance, a platform of non-Congress parties led by the BJP in the region. The AGP recently broke away from the alliance. “This is a natural process and it’s not in any way politically motivated. What we felt strongly is that we must come together in one voice to oppose the Citizenship Amendment Bill. This is the coming out of the sentiments of the people. “Because of the responsibility, we as the leaders of the northeast, are to protect the region and the people. This is what motivated us today. This is not an organised meeting but something that happened very naturally,” said Sangma who convened the meeting and is president of the NPP. The bill which has already been passed by the Lok Sabha endorses citizenship for Hindu, Christian, Buddhist, Jain, and Parsi migrants who entered India before midnight on December 31, 2014. The bill has widely been opposed in Assam and other northeastern states. 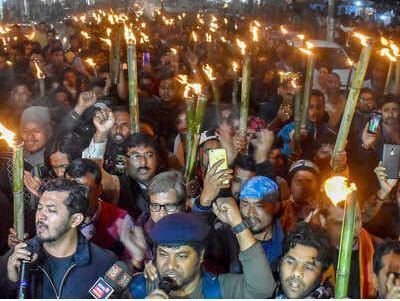 Only a few pockets in Assam’s Barak Valley have witnessed support for the bill.